DOM manipulation using built-in jqLite. All these features are achieved by AngularJS with the help of its MVC architecture. In order to understand AngularJS MVC Architecture better, we shall first explore on what is MVC. 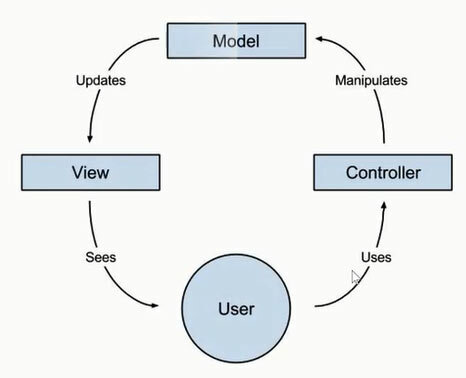 MVC is the acronym of Model View Controller. It is a famous design pattern for developing the web based applications. MVC is used to organize a web based application within three distinct layers and its ultimate aim is to separate the business logic from its associated presentation. Model – Model of MVC is accountable for maintaining the data. View – View of MVC is used to display the data in a presentable way to the User. Controller – As the name insists, the Controller of MVC is responsible for controlling interaction between the View and the Model. AngularJS Model – The data that is maintained by AngularJS is received from databases like Oracle, SQL Server or from the static files likes JSON. The data is then used for creating dynamic documentation. AngularJS View – In AngularJS, an angular view is created to display the data from the model. Double curly braces and directives are used in HTML code to create the view. Flow of information in AngularJS MVC architecture is demonstrated in the diagram below. As shown in the diagram, AngularJS view and AngularJS model are bound to each other, this two-way binding ensures that the view gets updated automatically when there is a change in the model. The binding between View and Model is achieved using AngularJS Controller. You can see the html file by opening in the browser as below. 1. It follows MVC pattern which helps to organize your web apps or web application properly. 2. It extends HTML by attaching directives to your HTML markup with new attributes or tags and expressions in order to define very powerful templates. 3. It also allows you to create your own directives. 4.. AngularJS supports two-way data binding , Any change in model will update the view and vice versa without any DOM manipulation. 5. It encapsulates the behavior of your application in controllers which are instantiated with the help of dependency injection. 6. It provides $http service to communicate with REST service. 7. AngularJS mark-up lives in the DOM. 9. AngularJS can be easily integrate with any other java script library. What is JavaServer Faces (JSF)? Copyright © j2eereference.com. All right reserved.